Are you really going to live in that thing? I have received several question about our RV. So I thought I would give a quick review of how we decided to go with a truck/fifth wheel combination. Like many families, we have been tent camping for a long while. As the years went by, and our sleeping on the ground got more uncomfortable, we decided to get a pop-up trailer. We had a small Scamper, but that didn’t work out very well for a variety of reasons. That turned into a nice boat that we enjoyed for over 24 years. We just sold it this fall. In 2001, we bought a small Keystone Laredo fifth wheel. We loved that trailer and it worked great for trips up to a week to 10 days. As we got serious about going full time, it became clear the Laredo was not going to cut it. So we started saving in earnest and researching what we really wanted. We have been visiting the Boise RV show with friends for many years. Before we entered the show each year, Serene and I agreed to not share our opinions until we had looked at all the models. Four years in a row we both agreed the Montana 3400RL fifth wheel was the one we liked best, and would fit our needs. We decided to go the fifth wheel route, which is less common for full-time RV-ing. 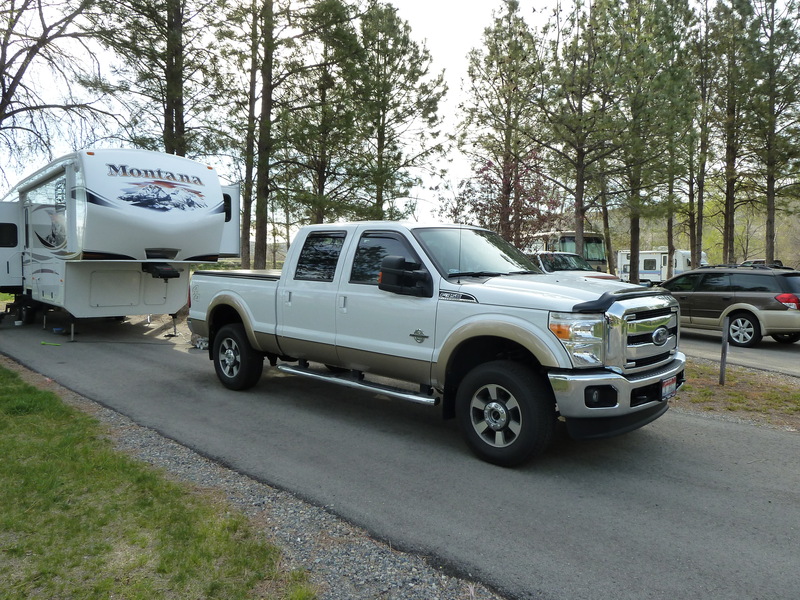 Many full-timers opt for a Diesel Pusher Class A motor home, towing an additional vehicle. We will use our truck (or our legs and bicycles) when we get to our destination for transportation and forego the additional engine, transmission, and their maintenance. We opt for more spacious living quarters available in the fifth wheel as compared to a Class A in our price range. 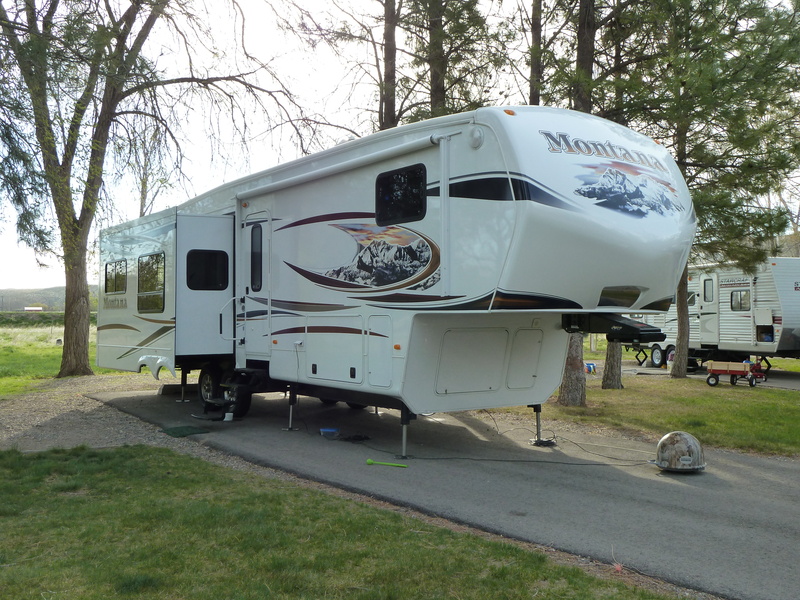 In March of 2012, we bought a new Montana 3400RL. This model has been the number one selling fifth wheel for the last 11 years. That was a selling point for me since I reasoned that most of the issues have be worked out. Also, we knew that feedback from their customers had been incorporated in the newer models. As with any product, there are always slight changes that take place, and I already see a few differences in our 2012 as compared to 2013 and 2014 models. Here is a link to the specs for all you nerdy engineers out there. We have a King size bed in ours. We also bought a new 2012 Ford 1-ton (350) Super Duty diesel crew cab pickup to tow it. We opted for single rear wheels, as opposed to dual rear wheels. That also allowed us to get a short bed, rather than a long bed. Turning and parking are better with a short bed, but it can’t tow as much. However, it tows the Montana easily. Combined, these two new purchases were less than any newer Class A diesel floor plan we have seen, in our price range. In fact, we haven’t seen a Class A floor plan we like yet. But we keep looking just for fun. I hope this was helpful to those that have been asking. 4 Responses to Are you really going to live in that thing? I watched the videos and the fifth wheel looks beautiful! Nice blog entry, Randy. I am excited about seeing your whole rig. I see why you wanted to go this route versus the Class A. Thanks Shari. Time will tell if we made the right choice, but we think we did. When we get it all ready in the spring, I’ll give you the grand tour. It was fun reading all about your ‘future home.’ I still don’t want you to leave your friends in The Hickories subdivision, but I noticed you will have hickory cabinetry so you can be reminded to think of your former neighbors daily (haha)! Do you drive this home on wheels, Serene?? ?